Last weekâ€™s ABC mini-series chronicled Bernard Madoffâ€™s $50 billion Ponzi scheme, which so devastated wealthy individuals and major institutions within the American Jewish community. Iâ€™m still taken aback by Madoffâ€™s icy lack of communal conscience or apparent self-limitation. He wiped out Elie Wieselâ€™s life savings, and stole $15 million from Wieselâ€™s foundation. Madoff stole from Sandy Koufax. Madoff even defrauded Hadassah. Nobody does that. Thatâ€™s like mugging your grandmother. I wrote about the case yesterday at the Atlantic website.Â Not everything could fit in that piece. Here’s some additional observations. Thereâ€™s much to be said about his crimes–not least about the incompetence of the regulatory apparatus that failed to stop him despite repeated warnings and what researchers Greg Gregoriou and Francois Lhabitant quite properly called â€œa riot of red flagsâ€ over many years. The biggest red flag was the simple knowledge that almost no investment reliably outperforms a simple index fund or can promise anything approaching the stock marketâ€™s overall returns without the marketâ€™s accompanying downside risks. Anyone who promises otherwise is likely deluding himself or trying to delude you…. Knowing that, many people should have asked serious questions that would have detected Madoff’sÂ fraud long before it blew up. 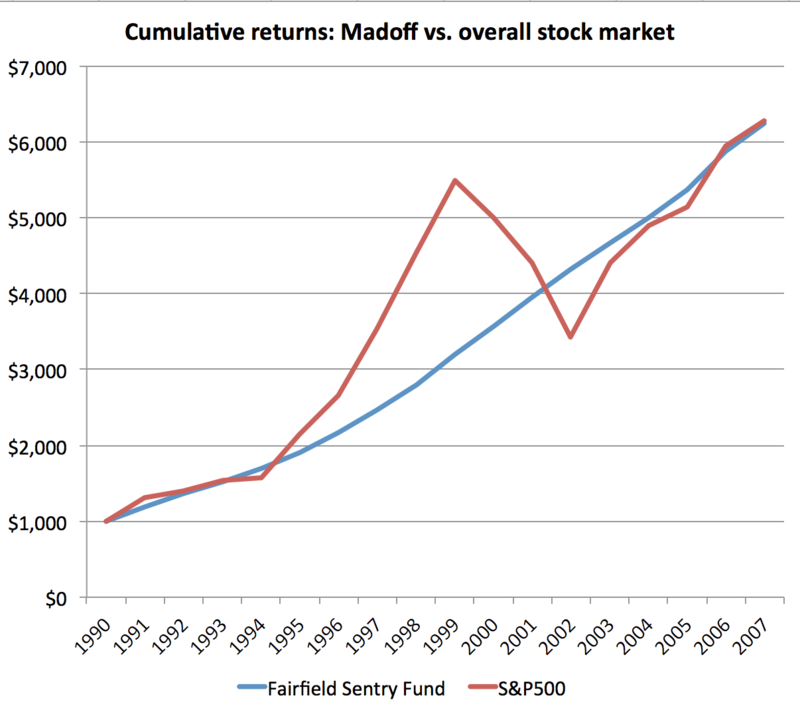 The below graph, based on Gregoriou and Lhabitantâ€™s report, shows the supposed cumulative returns if one invested $1,000 in a Madoff feeder fund (Fairfield Sentry), verses what would have happened if one simply invested in the overall stock market. Madoffâ€™s supposed returns are shown on the blue line. The stock marketâ€™s overall returns for a simple index of the 500 largest firms are shown in the red line. For various reasons, this is a rough calculation, but the pattern is obvious. Madoff claimed to deliver the same returns as the overall market with almost no volatility whatsoever, during one of the most turbulent stock market periods of the postwar period. Ordinary investors can hardly be blamed for not knowing that this is extremely implausible.Â As a matter of public policy, it amazes me that government regulators and the highly-paid financial professionals duped (and paid) by Madoff failed to follow up with the hard questions and rigorous independent auditing that probably would have stopped Madoff before things blew up. Madoffâ€™s was only the most glaring example of much more widespread regulatory failures that came to light with the mortgage meltdown of the Great Recession. State and federal regulators must devote substantial and sustained resources to address continued widespread fraud on Wall Street, but also in every large and small community across the country. Whatever policymakers might do to address these problems, we as individuals should be especially skeptical of any financial product embraced by influential people in our religious, cultural, or political communities. Sadly, an entrepreneurâ€™s deep involvement with your communityâ€™s political or cultural leaders, or with local philanthropy, is, itself, at least a yellow flag of caution. After all, firms that make outsized profits within a particular community have, by definition, the greatest incentive and resources to make these communal investments. Thatâ€™s a chronic problem within low-income communities that desperately need philanthropic support, but that also need to regulate predatory financial products that specifically harm these communities. A sad development in the subprime crisis was the effort to con or to coopt community leaders and community institutions to steer families into overpriced loans. Communities were financially devastated when the foreclosure crisis came to light. That’s the most obvious harm. By co-opting orÂ exploiting localÂ institutions and the informal bonds of trust that hold communitiesÂ together, the practitioners of affinity fraud do another kind of damage, too. This may be at least as hurtful, and as long-lasting. I think it's worth pointing out that, until roughly '95 his fund was tracking the market, and from '95 to '99, he was *underperforming* the market. Being steadily worse than the market is not quite the red flag that being steadily better than it is. It's from '99 to 2002 that should have tipped people off, continuing steady growth even as the market is collapsing is extraordinarily unlikely. Being steadily worse than the market, while paying handsome dividends, however, is a major red flag (although, as you point out, not quite as strong as later.) I can tell you with absolute certainty (I know some of the people involved) that there were at least 10 people in senior positions of Wall Street firms who not only knew that "something" was up, but refused to invest with him and counseled their clients not to invest either during the '95-'02 period. Shameful. I think that's a very good point. Although, at a certain level, that was actually very appealing to his more "sophisticated" clients who had a general understanding of the points you have made but assumed that he was able to do this either because he was "smoothing" his earnings by downplaying really good years so that he could carry over some of the profits into weaker years. Equally, most people believe that his was trading on the basis of some kind of inside knowledge—either "front running" the clients of his legitimate firm or by paying for advance knowledge of events such as mergers and acquisitions. Some people may be felt a certain degree of smug satisfaction knowing how the trick was done and, more importantly, that it was done by cheating others. Thereby disregarding Guthman's first maxim that anyone who will steal for you is equally likely to steal from you. It's the complete lack of volatility that should have been the very red flag. I also think that part of Madoff's success stems from the willingness of at least a few of his investors to profit from what they reasonably suspected was not quite kosher strategies. I know of at least one investor who believed that Madoff's profits came from some sort of front-running. It's not true that you can't cheat an honest man, but it's a little harder. The red flag was that nobody knew where he was putting the money. What was the nature of the statements Madoff issued to investors? I never saw one but I have spoken with someone whose employer (a Jewish charity) was a Madoff client. The statements looked like ordinary brokerage statements. They apparently showed recent transactions and positions, mostly in individuals stocks. He didn't mention any exotic investments or positions in the other hedge funds that would be hard to value. No, the lack of volatility really should have tipped people of. Not the average investor, or even many of those who invested with Madoff, but professionals in the field and regulators should have taken notice. If anything, generating the same returns year after year no matter what the market does is a bigger red flag than consistently outperforming the market. That's especially true here, where the outperformance wasn't very large. This is one of the reasons why effective regulators are critical and we can't just rely on consumer savvy and the free market. Recognizing the signs of fraud here was beyond the knowledge most people have about finance and investments, and the requirements are well beyond what most people can possibly manage across all of the fields where it is necessary. Any system that relies upon conventional wisdom is going to be rife with fraud. Two comments; first, I wonder how many savvy Wall Street insiders figured out fairly early on what Madoff was doing, but chose to do nothing but steer clear of him — "Not my problem." Second, I marvel at the bizarre situation in which a successful Ponzi schemer like Madoff has placed himself: if he has a lick of rationality, he has to know it will all end in cataclysm, either for himself or for his family shortly after the funeral, but his only short-term options are keep living the golden lie — or trigger the cataclysm. There is no middle way. I am not in any way defending, just marveling. Call me naive, but I don't think it's acceptable even among rank and file Republicans to rob people, even if you don't use a gun. (Though one of my libbie friends who follows the market hadn't heard of the CFPB as recently as maybe 2 years ago, so I might be wrong.) So, why isn't someone out there arguing that we need to increase government resources to stop these abuses? There must be some common ground somewhere in there. Otherwise, why are all those right wingy people so angry? Instead of sniping with Hillary, which is boring and a turnoff, it would be nice to see Bernie take a bus tour through the South and talk to people about this. It's no accident these things keep happening. We *know* why they keep happening. Go make the sale! As you can see, I lead a rich fantasy life. Rank and file Republicans have been voting for people who rob them for decades. It was Romney's whole career, for instance. So it's acceptable at some level. Where we disagree is, I don't think they do know it. I think they've drunk so much Koolaid that for a long time they didn't see the supply side con… although, it sounds like they might be starting to notice. All it took was a worldwide economic catastrophe. You evidently have an insufficiently pessimistic view of the depravity of your fellow humans. Stealing from Elie Wiesel and a superannuated baseball hero may be heinous, but calling it out as incomprehensible in a week when there are headlines about two college students luring a 13-year-old girl to a bloody death? And do you really mean that it would have been less bad if Madoff had restricted his depradations to non-Jews? I think the biggest red flag for ordinary people was the Madoff refused to allow his customers to use custodian accounts to hold their cash and securities. This is something that is never ever done by honest money managers. Never. Not ever. The other point which apparently alerted some banks and investments firms not to allow their clients to put money with Madoff—in addition to the fact that he didn't use a custodian—was that his "legitimate" trading desk didn't handle either enough volume overall to account for both the trades handled for others and the much larger volume of business handled by the "elite" money management side of the business. Madoff sometimes explained that he was using his own traders but I have been told that pretty much nobody every saw these guys in the 3rd or 4th markets, which is very that kind of volume of a single stock or bond issue would have necessarily been handled. The people from the other firms who asked about this were told that Madoff was such a genius that he'd figured out a way to hide this trade, which was so obviously impossible that other banks and investment firms advised some of their biggest clients not to place money with Madoff's firm because something smelled very wrong. What Madoff seems to have done is to surround himself with very respectable and powerful people, some of whom may have been dupes and others of which may have been earning with the guy. More importantly, he was able to leverage these relationships to create both his mystique and his shield of respectability. And the more than he was able to put community leaders forward, the better able to attract investments from the Jewish community. At the same time, those relationships protected him from SEC employees who weren't prepared to risk their families futures investigating such a "pillar of the community"